Buffy: Ooh, I like your headband. Where did you get it? lime: Thank you! I knit it myself. Buffy: Hmm. WIll you knit one for me? lime: I’m sorry, I have too many projects. If you’d like, I can teach you how to knit. My gauge with the garter stitch, thinner yarn, and US 6 needles was 4.5 stitches to the inch. I cast on 108 stitches and got a perfect 24 inch length. There is enough give that I can just tie it around my head. No button needed. This artistic picture was taken after after machine washing and drying the headscarf. The fabric is wonderfully soft. I had hoped for results akin to the Euroflax linen washcloths; the cotton upped the softness factor. The color in the picture above is much truer than the one below. 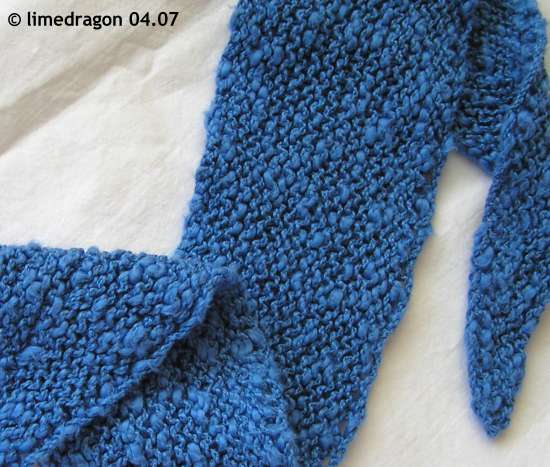 Someday, when I find the right yarn, I’d like to knit a heavier weight version. I used up nearly 50% of this one skein, so I need to find another use for the remainder. Hey, limedragon. How does the yarn hold your hair? It looks simple and yet elegant. Looks awesome with your red hair! Wish I had longer hair now! Nice job! That really worked well. Who knew? Who knew Limedragon was really a vampire? Whew. Glad Buffy saved the day. Very cute! It looks great. It looks so soft and squishy! I love it in the garter stitch. Brilliant! ooohhh…I love it. Great color for you too! Love it, love it, love it! Simple and elegant, and not so fancy one cannot use it! 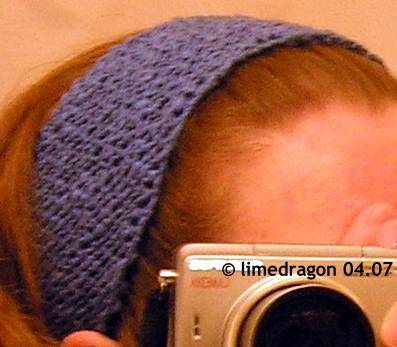 I have a problem that my head is kind of narrow (there are lots of head bands out there which look great, until they meet my head, that is), and here is the simple solution. Thank you!